Help!! I've ruined my boyfriend's coffee table with nail polish remover and need advice! Yesterday, like an idiot, I was using nail polish remover on the coffee table. It of course leaked through onto the table and leaving a sizable mark on the table. He tried to play it cool, but I know he was mad as I would be as well. Any advice how on how to repair it before I replace it would be greatly appreciated. It’s a mass produced piece of furniture, so I don’t think it’s stained. The color came up too quickly/easily. First the good news: the finish is probably lacquer. Newly applied lacquer will melt in with the existing finish without creating a ridge. Now the bad news. Instead of using a traditional staining process (wood is stained and THEN covered with a clear lacquer), production furniture makers use a toner. A toner is a mixture of lacquer and stain/dye that is sprayed onto the piece in a single step. They can get a lot more color onto the wood doing this. Your nail polish remover has removed the toner exposing bare wood. The end result is that you’re going to have to match the color (either stain or dye). In my opinion, the best way to do this is to try stains until you get the right color. You’ll want to test it on the underside first. You’ll then need to mix some brushing lacquer, lacquer thinner and stain. The best is to apply thin coats with an airbrush. Harbor Freight has some cheap ones that work for this but you’ll need a compressor. 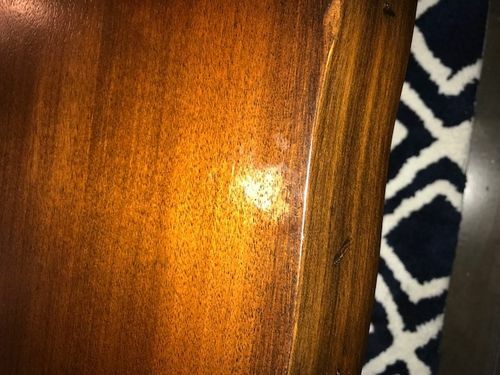 If you can’t match the color, you might get a decent repair by brushing on some thinned lacquer onto the damaged area and trying to feather in some of the color from the area surrounding the spot. Again, try on the underside first if you can. Regardless, wipe down first with mineral spirits to remove any wax and cross your fingers that Endust or Pledge haven’t been used on the table. I’ve been pretty successful with these methods but I’m sure there are more experienced finishers on here that can add to or correct any of my recommendations. Good luck. Or, you could do like my wife does and strip and sand the whole thing to bare wood and refinish in a completely different color. Otherwise, Mark is right. “The Furniture Doctor” by George Grotz has a ton of info on problems of this kind. Plus, it’s an enjoyable, entertaining read. Surprising, given the topic. OK, here’s the easy way to do it. Go to a Home Depot or Lowes and buy a furniture touch up set of markers. Basically a set of magic markers in different browns to match furniture colors. Then, pull out a bottle of clear nail polish. Using the markers, color the wood to close to what is was originally. Then, touch up the area with some clear nail polish. You may want to apply it with a rag rather than a brush so it spreads out in very thin layers rather than a single thick layer. Apply a couple layers. Put a magazine over the repair and turn the table around so the damage is in a different location than before. She is not a wife yet, so she does not have to sand . Girfriends have their ways to deal with these things. OK, here s the easy way to do it. Go to a Home Depot or Lowes and buy a furniture touch up set of markers. Basically a set of magic markers in different browns to match furniture colors. Then, pull out a bottle of clear nail polish. I’d try this before I messed around with mixing new lacquer + colors. The repair marker things are actually not bad. If you have any artistic talent at all, you can even try to match the wood grain with a darker color after filling in the lighter color. You can also do that with a pencil. You can then either use clear nail polish or a bit of lacquer to put the clear coat back on. I haven’t personally used it, but I’ve seen a product from Touch Up Solutions for this type of repair. It is a tinted aerosol that comes in about a dozen different colors. I can’t say for certain if it is lacquer based or not. It is available at Woodcraft. Hope you find a good fix. Touch up solutions used to make a powder that you kind of rub in the color then needs to be sealed. The advantage to this method is that it is controlled better. using markers and such, you always seems to get color on the surrounding area that wasn’t damaged. Same with a toner. I think you need to go buy him a new Sawstop Table Saw and if possible some wood so he can make a new table!